Umha Aois is a group based in Ireland dedicated to experimental archaeology and research into Bronze Age metalworking technology. Their symposium meets annually and is attended by artists, sculptors, archaeologists, and researchers from around the world. Over the years that the group has worked together, difficulties often arise in working with early technology and the group works to address these questions using materials that would have been available in the Bronze Age. This report examines one solution to a problem that appears to have unexpected parallels from the Late Bronze Age in southeast England. Every year the Umha Aois symposium begins with preparation of the mix of clay, sand, dung, and hay that will be used to make and repair the furnaces for the week. The same mixture is used for making the rough outer layer of moulds, and is adapted to other uses by adjusting the ingredients to suit specific purposes. Over the years various furnace designs have been tried and used for experimental work. One of the earliest designs was a short shaft furnace 40-50 cm in diameter and 30 cm deep with a tuyere hole cut into the base. These worked well for heating larger quantities of metal for casting larger objects such as swords. Another furnace design was a shallow clay-lined pit. These pit furnaces are designed to accommodate the size of the crucibles used for the firing and the size is primarily determined to create the optimal ratio of space for the charcoal in relation to the size of the crucible used. A typical size used for melting enough bronze to cast an axe or similar object could measure approximately 20 cm dug up to 30 cm into the ground. This type had a hole leading from the bellows at the surface to the base of the furnace. The furnace was filled with charcoal and the crucible nestled in the charcoal. The problem was that the furnaces were not working as well as they should. The heat would not distribute evenly, resulting in difficulty in getting the bronze to melt. The bellows were checked to see if they provided sufficient air-flow. The air was going into the furnace, but it was not working properly to heat the charcoal evenly. It was found that the air was blown directly into the charcoal causing the charcoal closest to the tuyere to burn rapidly and create a void directly in front of the tuyere. The result was that the charcoal in this area was superheated, burning and collapsing on one side of the furnace and the heat was not distributed evenly to the upper layers. In 2005 Cliodhna Cussen was describing the problem to two men from England who were participants that year. They explained that what she needed was to construct something similar to a carburettor in an automobile engine. They described a chamber and baffle that caused air to circulate and distribute. From this description Cliodna envisioned a ceramic device that would create a separate lower chamber while supporting the charcoal and crucible. Since the air would be fed into the lower chamber by the tuyere hole connected to the bellows, the device would need holes to allow air to be forced up into the upper chamber, but not so large that charcoal would fall into the lower chamber. The resulting design became what she called a “tea pot stand”. The air would circulate below the charcoal and then come up through holes of the stand, evenly heating the charcoal throughout the furnace. The furnace was modified so that the tea pot stand was fixed at about 10 cm from the bottom of the furnace. A tubular tuyere hole was cut so that it fed into the bottom chamber. The design for the tea pot stands also went through some variations. At first they were built with legs, but these proved to be unstable. It was found that adding small ledges at intervals along the interior of the furnace provided a more reliable support. 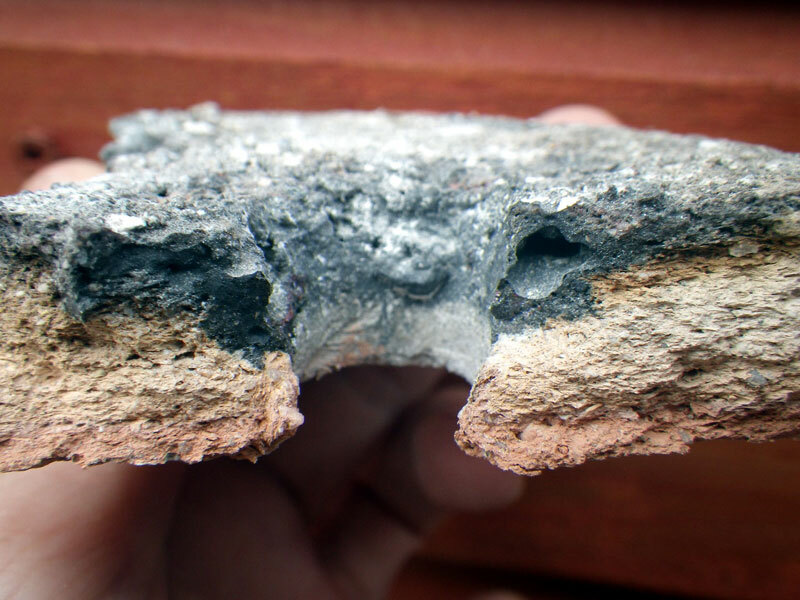 The standard clay mixture was modified to include additional organic material to prevent vitrification and breakage due to the variance of heat. The final design for tea pot stands are flat circles of clay made to fit the inside dimensions of the furnace, and are about three cm thick, with six to eight holes approximately 2.5 cm in diameter that are placed evenly around the circumference, about five cm from the edge. In a standard furnace, the tuyere hole is cut into the bottom of the side. The charcoal closest to the tuyere burns hotter and more quickly, creating a void. Subsequently a cool spot develops where the air from the bellows circulates without being heated. The consequences are uneven heat with the introduction of increasingly cool air, and voids introduced by the rapid burning of charcoal in a concentrated area. The void area contributes to destabilising the crucible, which is set in and supported by the charcoal. In order to maintain an even heat, the hotter charcoal from the sides and rear of the furnace must continually be shifted to the front. More even heating could be accomplished by using more than one set of bellows; however this does not solve the problem of voids caused by the overheated charcoal. The introduction of the tea pot stand solves the problem of uneven heating since the air is introduced into a lower chamber where it circulates and is pushed upward into the charcoal. The air is thus pre-warmed and evenly distributed so that there is a circle of evenly spaced hot spots beneath the crucible instead of a single hot spot that contributes to empty areas where the charcoal has burned out. In addition the tea pot stand provides a stable platform for the crucible, mitigating accidental spillage caused by the instability caused by voids or the constant need to rearrange the charcoal. While researching Bronze Age metalworking technology for my PhD thesis, I was struck by the similarities of Cliodhna’s tea pot stands to a group of Late Bronze Age objects called “perforated clay slabs”. The purpose of the slabs is unknown, although they have been interpreted as having been parts of ovens, pottery kilns, used for cooking, or salt production. Perforated clay slabs have been excavated at the Late Bronze Age sites along the Thames River Valley including Mucking North Ring, Essex and Queen Mary Carshalton, East Surrey , in addition to Yiewsley, Coombe Hill, Springfield Lyons, and Highstead (Champion 1980). At Mucking North Ring the slabs vary somewhat in thickness, but the fragments appear to be consistent in size and shape. Again none of the slabs have been found whole. The colour of these slabs is more uniform ranging from red to reddish brown. Only one displays a variation of colour from one side to the other. The fabric has varying amounts of flint and uniform holes, thought to have been pushed through the clay with a stick. The average size was estimated to be 16 by 11 cm, and 1.5 cm thick with 1.5 cm holes placed about 3.5 cm from the edge. The reports did not interpret that perforated clay slabs were used in association with metallurgy, but they have been found at sites where there was evidence of metalworking. A bronze ingot, fuel ash, fragments from a crucible and mould, spilled bronze, and a lump of copper were found outside the enclosure ditch at Queen Mary’s Hospital just north of the east entrance, in addition to a possible crucible fragment and waste material from casting. Evidence of hearths in the ring ditch suggested that metalworking and other activities that produced fumes and smoke were practiced in the ring ditch or just outside the settlement (Adkins and Needham 1985). This same pattern is seen at Mucking North Ring where both evidence of metalworking (clay moulds and a crucible fragment) are found outside the north terminal of the east entrance of the ring ditch. At both sites perforated clay slabs are found outside of the settlement near the north side of the eastern entrance to the ring ditches. It was noted that none were found inside the enclosure, and they did not appear to be associated with domestic activities (Bond 1988). Adkins and Needham suggested that the perforated clay slabs could have been used for draught control in ovens or furnaces. 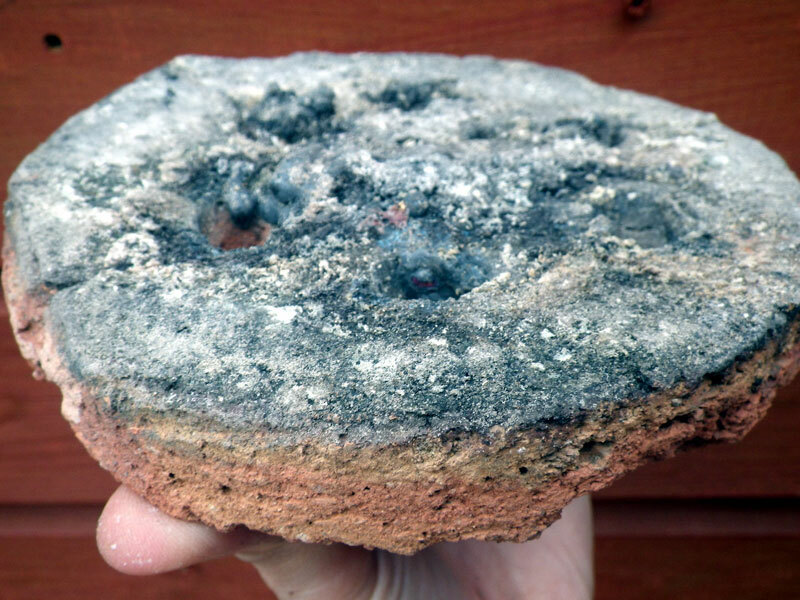 Similar perforated clay plates have been found at Roman sites where pottery was manufactured, and were considered to have a similar function as kiln shelves (Adkins and Needham 1985, 38). While there can be many interpretations for the perforated clay slab, their use in bronze casting furnaces is highly plausible. They are found in the same context as metalworking debris, outside of the eastern entrance of settlement ring ditches. Unfortunately no definitive Bronze Age metal casting furnaces have been excavated and so their use as supports will never likely be verified. However, the similarity to Cliodhna Cussen’s tea pot stands is remarkable. The perforated clay slabs are smaller than the tea pot stands; however the size is determined by the dimensions of the furnace, averaging from 15 to17 cm wide for the pit furnaces and larger for the shaft furnaces. No intact perforated clay has been excavated, although the two perforated clay slabs from St. Mary’s Hospital are the most complete and would give an estimated interior of a furnace to be slightly larger than the 18 x 23 cm dimensions of the slab. The differences in colour between the two surfaces of the slabs found at Queen Mary’s Hospital could indicate uneven heating. Such differences are also seen on the tea pot stands used by the members of Umha Aois, where the colour variation is the result of one surface being in direct contact with the charcoal and the other exposed to the cooler air introduced from the bellows below. In using the tea pot stands, it was noted that they were variable in their durability. At times they failed on the first casting possibly due to internal faults or other factors such as uneven tempering or the experience of the person making them. Failure can also be attributed to the practice of air drying and then baking in furnaces used for melting out wax from clay moulds rather than firing them in a pottery kiln. Any primitive ceramic, no matter how well fired, would be stressed by the temperature variations the material is subject to, in addition to supporting the weight of the charcoal and a crucible filled with metal. However if they survive the initial castings and are treated with care, the tea pot stands can survive for as many as 15 or more casting episodes (pers. comm. James Hayes). If no intact stands are readily available then fragments of broken ones are carefully stacked to create a support that creates a baffle for air. While this was less efficient for airflow, it minimises uneven heating and provides support for the crucible. The on-going experimental work performed at Umha Aois provides a unique opportunity for understanding Bronze Age technology. The members are all experienced metalsmiths who individually bring their experience and understanding of the craft to the annual symposium. Rather than archaeologists seeking answers to questions about craft, Umha Aois is a gathering of artisans seeking answers to questions about archaeology. The creation and use of the tea pot stands highlights how innovation was used to improve casting success. Cliodna and the others at Umha Aois had not known about the perforated clay slabs found in southern England, their objective was to solve a problem that could have also been a problem for Bronze Age smiths working in similar circumstances. The perforated clay slabs are a curiosity that does not fit into any known category of object type. If they could be the debris of metalworking, then they could provide insight into furnace design and metalworking traditions in the region of the Thames River Valley. There is no definitive proof that perforated clay slabs are the same as tea pot stands, or that they served the same purpose. However rather than serendipity, the invention of the tea pot stand, independent of the knowledge of perforated clay slabs, was developed to solve a problem in casting bronze in a Bronze Age context. This innovation highlights the importance of on-going independent experimentation in early craft, and the importance of the contribution of experienced artisans to experimental archaeology. Thanks to: Cliodna Cussen, James Hayes, Padraig Mc Goran, and Niall O’Neill for their assistance in preparing this report. Adkins and Needham, S. 1985 New Research on a Late Bronze Age Enclosure at Queen Mary's Hospital, Carshalton. Surrey Archaeological Collections 76. Bond, D. 1988. Excavation at the North Ring, Mucking, Essex. Chelmsford: Essex County Council, Archaeology Section. Bruce, P. and Giorgi, J. 1994. Recent work at Orchard Hill, Queen Mary’s Hospital, Carshalton. London Archaeologist 7. Champion, T. 1980 “Settlement and environment in later Bronze Age Kent” In The British Later Bronze Age Part i. John Barrett and Richard Bradley, eds. BAR British Series 83 (i). Oxford, B.A.R.